Creating robust and effective temporary weather protection or containment around a building project that remains in place for the duration of a job can be a challenge, especially for long term projects. A common problem is that the scaffold sheeting becomes loose over time and eventually completely detaches from the scaffolding. Of course, no temporary sheeting solution can provide a 100% guarantee of success for every application and weather condition but there are products and available which reduce the chances of sheeting causing a headache on your next project. So, what options are available to a scaffolder or contractor who is looking to provide weather protection or environmental containment around a construction project where detached sheeting would have serious consequences? Typical jobs which fit this category are where scaffolds are adjacent to railways, roads or power stations, where the sheeting is containing potentially toxic blast residues around a bridge undergoing blasting and painting, or where sheeting is providing weather protection over a ‘heritage’ project. 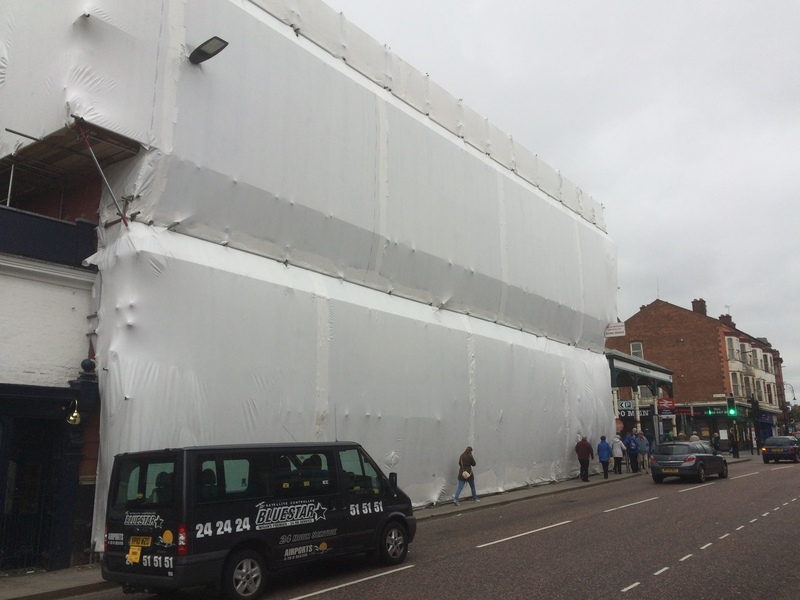 Of course, detached scaffold sheeting is not a big problem for some projects or customers. 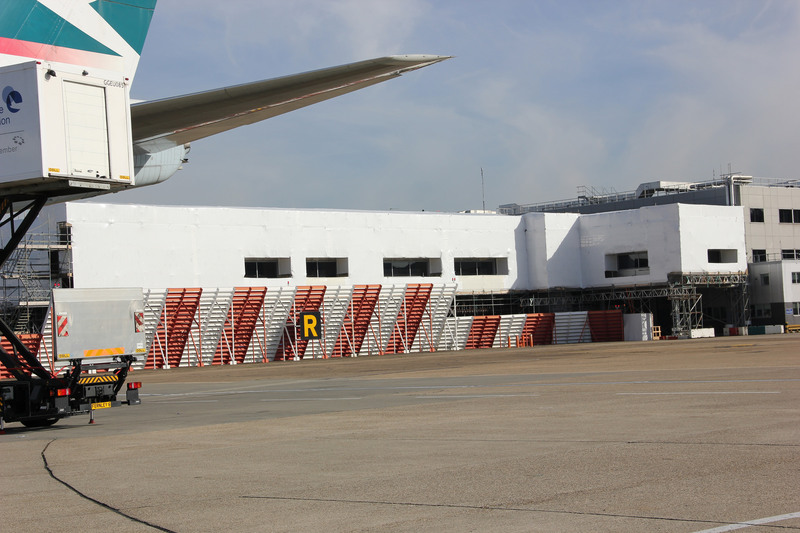 For smaller or domestic scaffolds, which are only required for short term projects, then a basic level of temporary weather protection may be sufficient. Why does it matter if scaffold sheeting detaches? 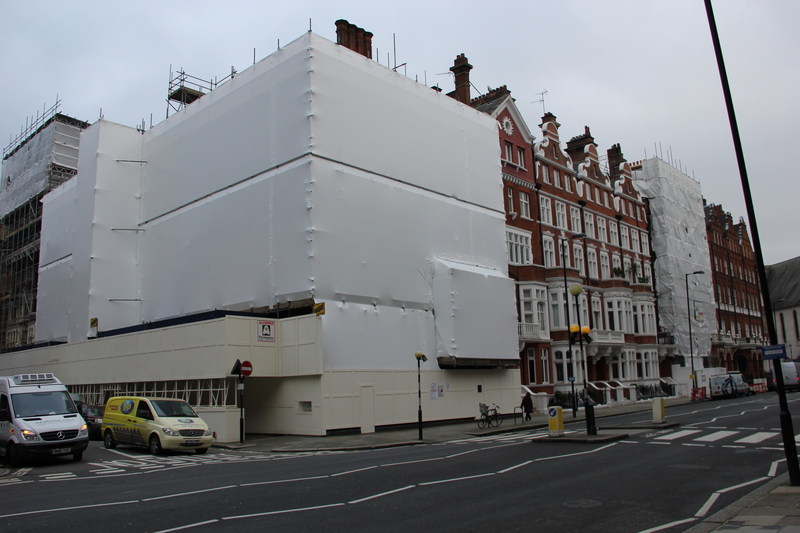 For the main contractor, detached scaffold sheeting can create unsafe conditions for workers on site. If the sheeting is providing essential temporary weather protection or environmental containment, then work may have to stop. Many building sites are members of the Considerate Constructors Scheme and flapping or detaching sheeting can annoy and sometimes endanger members of the public. For the scaffolder, damaged scaffold sheeting is a problem because they may have to go back and repair or completely replace the sheeting. 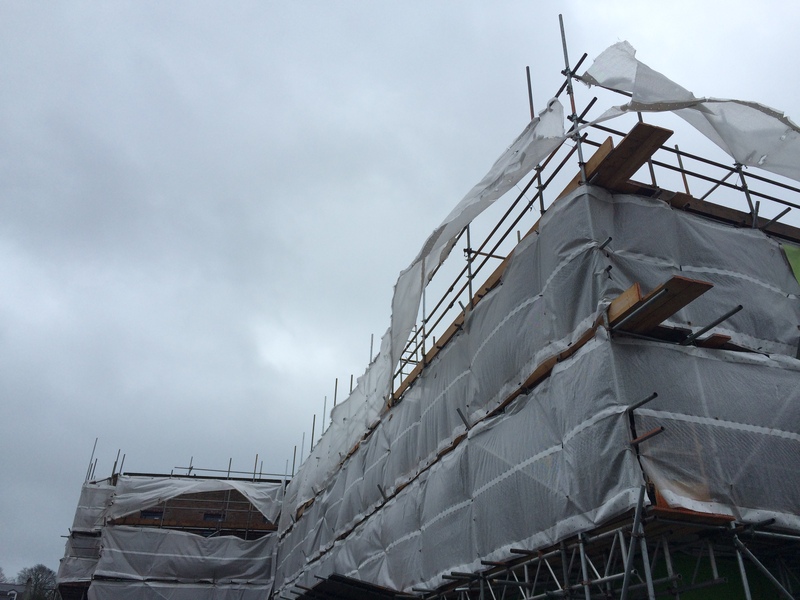 Scaffolders may go back to some projects 3-4 times to re-attach failed scaffold sheeting. This means pulling their teams from other jobs, and buying more sheeting to replace what has been damaged…..and they also have an unhappy customer (the contractor). This article looks at this difference between conventional scaffold sheeting products and shrink wrap scaffold sheeting in more detail. Shouldn’t scaffold sheeting detach for ‘safety’? There seems to be a fairly common assumption that conventional scaffold covers are designed to detach at a specific wind speed as a ‘safety’ measure. However, although figures are available for the break strength / load for each tie, or the pullout strength of eyelets, the ‘safe’ wind speed for any given scaffolding is not generally provided by suppliers. In the case of the Monarflex flexi tie, the breaking load is 450N but higher specification ties are available, (for example, the Monarflex ‘anchor and strap’ tie, has a breaking load of 500N.) Nevertheless, if a scaffold is to be sheeted, the scaffolding has to be designed to withstand the wind loading it may be exposed to, no matter what sheeting is used. A scaffold designer will not design a scaffolding differently according to which grade of Monarflex or which type of tie is to be used or whether an alternative product such as shrink wrap for scaffolding is to be applied. The point here is that conventional / traditional scaffold sheeting is a great product, and a good choice for many projects. However, we should not use it simply because it is ‘designed’ to detach at a specific wind speed and believe we have fulfilled all our health and safety obligations. A scaffolding structure should be always be designed by a competent person when any type of sheeting is to be applied. Traditional style scaffold sheeting is generally supplied as a 2, 3 or sometimes 4 metre wide sheet. It is usually tied to the scaffolding structure using an elastic shock cord or ‘bungee’. The sheet is typically made from two layers of LDPE plastic film which sandwich a reinforcing ‘scrim’. 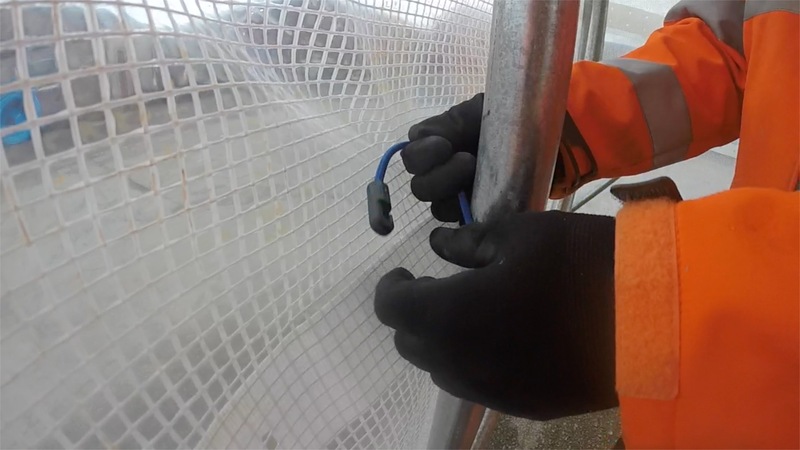 Reinforcing bands (or eyelets on higher specification sheeting) are provided at interval along the sheet which allow a tie to be pushed through the plastic sheet from the inside, wrapped around a scaffold tube and tied. There are many manufacturers of this type of sheeting and scaffolders can buy traditional style sheeting from many sources, although Monarflex is probably the best known. Monarflex product data sheets and specifications are easily accessed via www.monarflex.co.uk. According to Monarflex, the ‘economy’ Stripe or Scaffband ranges, used in conjunction with the standard Monarflex blue flexi tie are only recommended for use on shorter term projects that will not be exposed to the risk of high wind. According to the Monarflex website, a lower wind speed than 40mph may be sufficient to potentially remove these grades of sheeting from a scaffolding structure. Once the limitations of this type of sheeting are understood, the best way to stop it detaching is to install it in strict accordance with the manufacturers instructions which includes using a minimum of one tie per square metre of sheeting. Alternatively, if you are using ‘traditional’ style sheeting, you might consider a higher grade of sheeting such as ‘Super T Plus’ by Monarflex. What else can you do to stop sheeting detaching from the scaffolding? 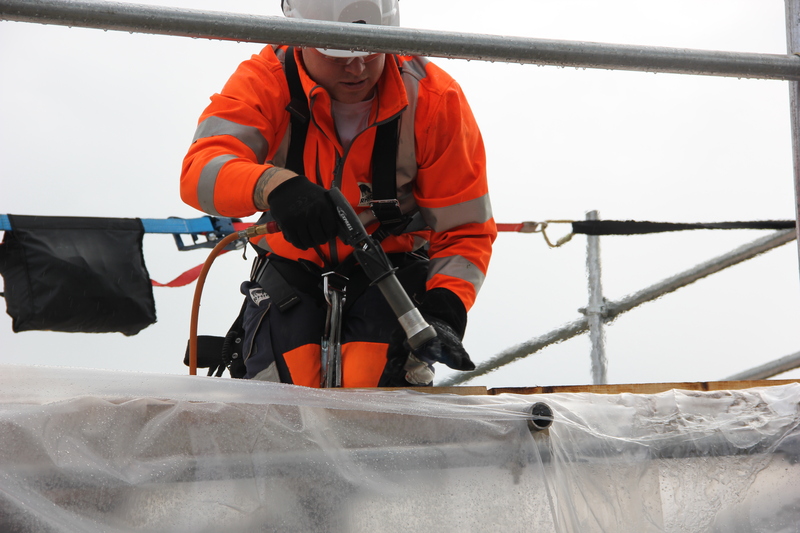 Another option is to use a ‘shrink to fit’ type of scaffold sheeting known as scaffold shrink wrap. Before we dive deep into why shrink wrap may be suitable for many projects where there is a high risk / consequence of the sheeting becoming detached from the scaffolding, it might be helpful to quickly consider some of the forces involved when wind blows on or across scaffold sheeting. The wind load or force which acts on scaffold sheeting is a combination of the mass (weight) of the wind and the wind speed at impact. This wind load is ‘balanced’ by the tensile stress of the sheeting. To avoid a scaffold sheet breaking, the tensile strength of the sheet must be greater than the tensile stress load produced by the wind. However, this is not the complete picture. After the wind load has been removed, with scaffold sheeting we need the sheet to return to it’s original state, i.e. we do not want the sheeting to be left baggy and flapping. In order for the scaffold sheet to return to it’s original state after a wind loading has been applied, the tensile yield strength must be greater than the tensile load that was applied by the wind. With traditional style scaffold sheeting, this tensile yield strength applies to both the sheeting itself and the elasticated bungees or other ties that are holding the sheeting to the scaffolding. If you have ever been back to scaffold sheeting and found that the bungee cords have stretched beyond return (they have no elasticity left in them), what has happened is that the load applied by the wind has been greater than the tensile yield strength of the ties. If the ties have broken altogether then the wind load has been stronger than the overall tensile break strength of the ties. How does the tensile strength of traditional style scaffold sheet compare with Rhino Shrink Wrap Scaffold Sheeting? The tensile strength at break for traditional style scaffold sheeting is typically much more than shrink wrap sheeting so why is shrink wrap often used on projects where high wind loading is expected? The answer lies in how the different types of product are secured / tied to the scaffolding structure. Whilst traditional style scaffold sheeting, with it’s reinforcing layers and bands may have ‘on paper’ a greater overall tensile strength, the strength of traditional style scaffold sheeting will depend very much on the strength of the anchors / bungee ties. The total wind load on the sheet may be within the strength of the traditional style sheeting but not within the strength of the ties. This is why it is sometimes necessary to install far more ties than the recommended minimum. Another part of the problem is that it is difficult to fit the scaffold sheeting tightly. When the sheeting is loose it will flap around and create point loads at the eyelets that exceed the break strength of the ties and / or sheeting. However, over tightening an elasticated bungee will risk that when a wind loading is applied, it may be stretched beyond the point of return and the sheet will become loose and saggy. So why may shrink wrap scaffold sheeting be more resistant to high winds than traditional scaffold sheeting? Shrink wrap may be more resistant to detaching in high winds than traditional style scaffold sheeting because it does not rely on ties (such as elasticated bungee ties) to fix the sheeting to the scaffolding. Instead, the shrink wrap is wrapped around a scaffolding tube and heat welded back on to itself. This welded joint is as strong as the original shrink wrap material. In addition, because the shrink wrap sheeting is heat shrunk ‘drum tight’ by the installation team after it has been hung and welded around the scaffolding, it does not flap and bellow. With traditional style scaffold sheeting, it is this flapping which is often what causes point loads on the eyelets or ties of traditional scaffold sheeting to exceed specification and cause failure. (This is one reason why traditional sheeting has the reinforcements around the eyelets where the ties pass through the sheeting). Shrink wrap moulds very very tightly around the scaffold structure, creating a ‘continously bonded skin’ that will not flap and chafe and detach. It doesn’t matter what type of sheeting you use, where a scaffold is to be encapsulated with sheeting, then a flush structure will create the best chance for success. A flush structure will allow you to fix the sheeting as tightly as possible and install ties in accordance with the manufacturers instructions. One of the many system scaffolds is easiest for shrink wrapping but regular tune and fitting is no problem so long as ledgers, transoms, handrails and boards are kept flush. Although shrink wrap sheeting from different suppliers can look Download the data sheets and compare specifications. Although we have seen how much of the strength of shrink wrap scaffold sheeting derives from it’s method of attachment to the scaffolding and hw it is heat shrunk ‘drum tight’, the basic mechanical strength of the shrink wrap is important also. Always compare specifications and choose a film that has the highest strength at yield (this means that it can ‘bounce back’ after experiencing wind loads and will not become baggy over time). For sheeting you should also consider issues such as flame retardant standards it has been tested to and the UVI that has been added. For a much more detailed investigation on what to look out for when buying shrink wrap for scaffolding click here. Attempting to fit any type pf scaffolding sheet in poor weather conditions may have an impact on the quality of the finished job. 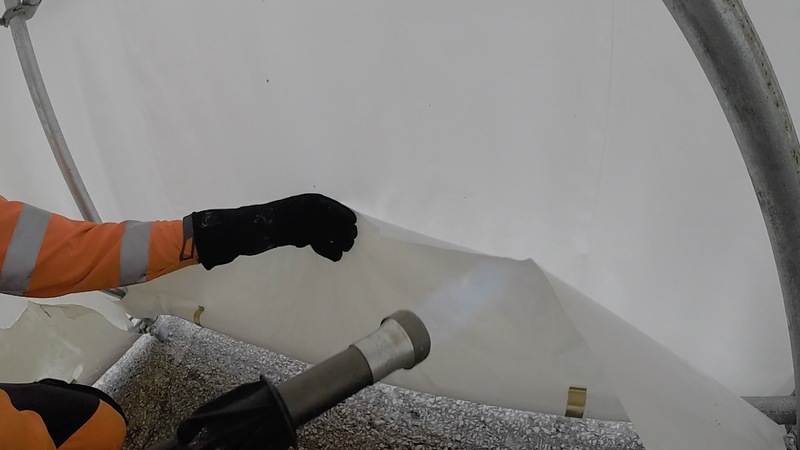 For shrink wrap coverings in particular it is important to ensure that the wrap is only heat shrunk ‘drum tight’ in light winds. Failure to do this may result in the ‘signature’ smooth wrinkle free finish being compromised – not great if the smart & professional appearance of the sheeting is important to you. In summary, whichever sheeting you use, you need to ensure that the scaffold is designed to withstand the extra wind loads that will be imposed on it. In addition, whether it be conventional products such as Monarflex or newer products such as Shrink Wrap, always use the best quality scaffold sheeting available and install according to the manufacturers recommendations. If you have any questions or require any assistance give our team a call at Rhino Shrink Wrap on +44 (0)1477 53222 or email info@rhinoshrinkwrap.com. We look forward to hearing from you.